Jack is an 10-year-old boy who has been a frequent patient at SickKids for most of his short life because he used to suffer from a severe form of epilepsy. 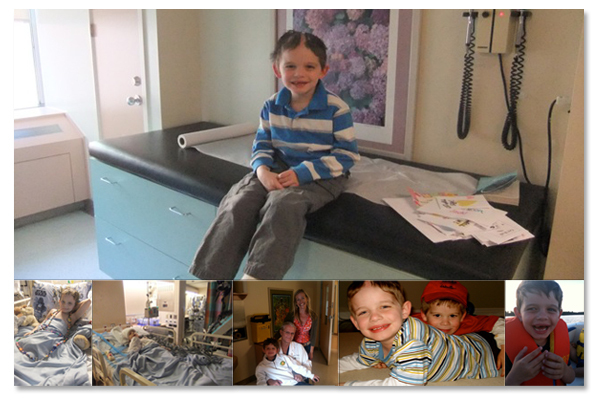 Jack's seizures started when he was a baby and despite all medical interventions, his seizures persisted and worsened. In January 2010, with no other options, Jack underwent a series of brain surgeries, which involved over 24-hrs of surgery and the removal of a significant portion of his brain. After the last surgery, his seizures stopped. His recovery included relearning how to walk and talk and today Jack is a healthy boy. His story is a miracle and he is alive today because of SickKids and the incredible doctors there. Jack is now in grade 6 and is living life to the fullest. He attends school at Wildwood Academy in Oakville and his favourite activities are playing with his younger brother Christopher, reading, and swimming at the YMCA. Since 2007, Jack has been selling lemonade to help other children at the hospital and he takes great pride in his lemonade stand, which he built with his dad. He knows that he is making a difference in the lives of other children and is proving that illness doesn't need to be a barrier to achievement. Jack's Mom and Dad are incredibly proud of him for how he has handled all of his medical challenges with such grace and resilience over the years. His gentle and compassionate spirit has taught both of his parents many life lessons. Jack and his family hope that one day a cure for epilepsy will be found.